One of the best ways to create an inviting outdoor living environment is building a patio cover. These structures are typically attached to the home and have two posts supporting the outer portion of the structure. The amount of shade and protection from the weather desired will help determine what type of roof fits best for you. The roof can be open air with a trellis or a solid roof. Where should you build your patio cover? While the answer to this question seems obvious, there are shade and functional considerations that need to be taken into account. Most patios are typically off the back door but that location may not provide an adequate shaded area. Covered patios are ideal for outdoor living areas, dining areas, built in fireplaces or outdoor kitchens. It is best to consult with a design professional to determine where the maximum amount of shade and functionality can be achieved in your backyard with your new patio cover. One other major factor in location of any new structure is city building codes and Home Owners Associations (HOA) restrictions. All cities have certain guidelines pertaining to where an attached or detached structure can be built. In addition to the City requirements, HOAs will have a set of guidelines pertaining to design, finish material and height restrictions among other things. Once again, it is best to consult a design professional that is familiar with your city’s requirements and HOA guidelines. How big should your patio cover be? The old adage “Form follows function” fits perfectly when we try to answer this question. The size of your new structure will vary depending on the space it is intending to cover. Careful consideration must be made for furniture size to ensure there is adequate circulation around any columns or posts. Furthermore, you will need to make sure you get the desired amount of shade from you new patio cover. In addition to length and width, height of the new patio cover will also need to be considered. A typical arbor or covered patio can vary from eight to eleven feet tall. 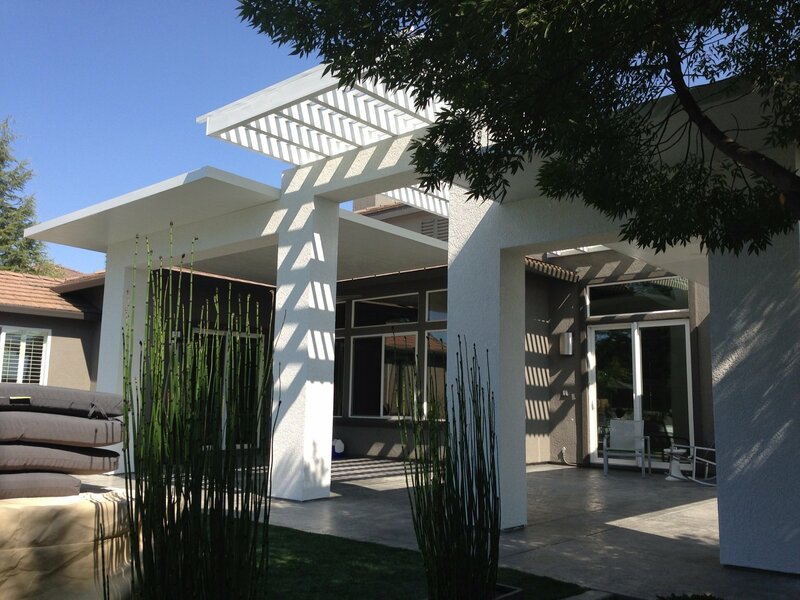 One of the pros of a shorter patio cover is you will be able to maximize the amount of shade. One drawback of these type of structures is it may start to feel cramped. The higher covered patio will feel more open but you will lose some of the shade coverage. Build Your Patio Paradise Today!